U.S. peace envoy Jason Greenblatt offered a rebuke of the Palestinian Authority and United Nations members who he said are enabling the embattled government to continue paying salaries to terrorists who have killed Jews, according to a readout of Greenblatt's remarks Friday to a closed-door session of the U.N. Security Council exclusively provided to the Washington Free Beacon. Greenblatt, who has been engaged in shuttle diplomacy to help foster peace between the Israeli and Palestinians, offered a robust defense of Israel and blamed the P.A. 's ongoing budget crunch on a package of policies that have enabled the government to continue spending internationally provided aid dollars on terrorist salaries, a policy known as "pay to slay." As the P.A. grapples with a deepening budget crisis that threatens its control, U.N. member states have sought to blame Israel for the situation, which has thrown the Palestinian government into chaos. Greenblatt fiercely pushed back against these charges, telling U.N. members that the Palestinians' problems are tied to their refusal to stop spending critical budgetary dollars on terrorists and their families. The "pay to slay" policy has emerged as a chief diplomatic hurdle in peace talks between the Israelis and Palestinians, sources told the Free Beacon, and Greenblatt used his perch at the U.N. to send a clear message: These payments must stop immediately if the Palestinians are to be seen as a serious partner for piece. 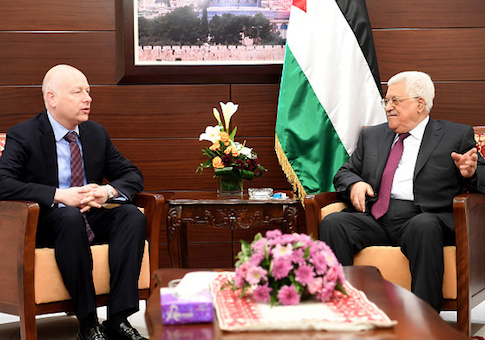 Greenblatt's criticism comes at a key time in peace negotiations, as the Trump administration prepares to unveil its much-anticipated framework for peace.